Jeff Saltzman has compiled a good list of Arduino compatable CPU boards. It can be found on his blog. While browsing other peoples blogs I found Joel Ewy’s cool blog on reimaging a Tandy / Radio Shack Color Computer 3 onto a single chip / FPGA. A new bigger Arduino has been spotted in the wild. 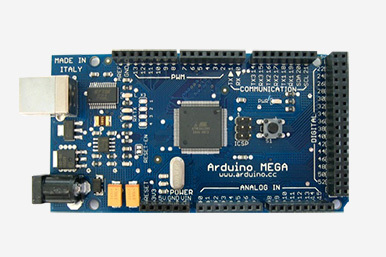 The Arduino Mega is the new larger brother of the Arduino Duemilanove microcontroller board. Instead of being based on a 28-pin Atmel ATmega168 or ATmega368 the Mega is based on the larger 100-pin ATmega1280 device. The Arduino Mega board has 54 digital input/output pins (of which 14 can be used as PWM outputs), 16 analog inputs, 4 UARTs (hardware serial ports), a 16 MHz crystal oscillator, a USB connection, a power jack, an ICSP header, and a reset button. only 6 of the external interrupts are available (the ATmega1280 has 8). 4 “new” external interrupts are on dual-purpose pins. 2 are on the TX/RX pins for Uart#1 (pins 18-19), and 2 are on the I2C pins (pins 20-21). the I2C pins have moved (from 4-5 to 20-21). Any Arduino shield, or project, using I2C will require re-work for the MEGA. the timers associated with specific PWM pins have changed, Interrupt 0 and 1 are on pins 20 and 21, Input capture for timer1 is not available, and pins 14 through 19 are no longer shared with the analog pins. My Arduino Mega arrived last Saturday 28th March from http://www.coolcomponents.co.uk. This was a pretty quick service from Coolcomponents as the Mega was only announced on Thursday 26th March. The additional I/O will be very useful, as will the larger available board area => bigger shields but the Arduino Mega still have the problem of available coast area for I/O connectors. You don’t need a Wii, PS3 or Xbox to have a great gaming experience. If you really want to get to know the hardware of a video game console then build one of the many cool designs available on the web (or if you’re really cool design one yourself). Some are one chip designs, some are multichip almost computer like designs and the others somewhere in between. Most are powered by 8-bit micros, one or two have 16-bit micros and a few use 32-bit micros. If you know of any others please add a comment and I’ll update this list over time. Although the Arduino system and software has been around for a couple of more years it has really gained in popularity over the last year. Logging onto their Forum shows over 10,000 registered members. The current basic design Duemilanove is based on a Atmel ATmega168 Microcontroller, clocked at 16Mhz with 16K Flash memory, 1KB SRAM and 512-bytes EEPROM for the ATmega168 or 32KB Flash memory, 2KB SRAM and 1KB EEPROM for the ATmega328 variety. The 2.1″ x 2.6″ (51mm x 73mm) PCB has 14 Digital I/O Pins (of which 6 provide PWM output and others can provide UART, SPI or I2C functions) and 6 Analog Input Pins. Like any good idea, Arduino has provided inspiration for others and there are many other “Arduino” compatible or similar boards to choose from such as Freeduino, Boarduino and Seeeduino. For me, Arduino invokes the spirit of the 1970’s where the early computer hackers, pioneers and developers shared their knowledge for the greater good of the computing community (who knows could we see a new Bill Gates emerging – OK perhaps not as rich). The Uzebox project, by Alec “Uze” B is a minimalist open sourced 8-bit game console.The Uzebox design contains only two chips: an ATmega644 and an AD725 RGB-to-NTSC converter and is designed to be easy and fun to build and program by any hobbyists. To showcase Uzeboxs power have a look at Alec’s fully functional Tetris clone named “AVR Megatris”. You are currently browsing the Zuzebox's Blog blog archives for April, 2009.